Quote: "I once did an interview with a friend, and she said, 'Don't you think Botox should be banned, like steroids for athletes?' I said, 'Yeah, yeah!' And that became this quote of mine, when in fact I think people should do whatever they like, whatever gets them through the day." Actress Rachel Weisz regrets making an aside in a past interview. Quote: "He's just too famous, it would be a betrayal. You have to protect your marriage. When you're young, you tell your girlfriends everything. One of the great pleasures of not being an adolescent is that you don't have to share everything. When you're married, that door closes. The audience goes, and you're in your own life." Actress Rachel Weisz explains why she prefers to keep details about her marriage to James Bond star Daniel Craig out of the headlines. The couple quietly wed in 2011. Quote: "Jack White is how I'd like to act. You can tell he isn't faking it and that the band really don't know what they're going to play next. It's abandon. He just lets himself go. Abandon plus skill plus technique. That's a great cocktail." Rachel Weisz has found an unusual acting inspiration in rocker Jack White. Quote: "When I turned 40, it was one of the best years of my life; I played Blanche in A Streetcar Named Desire, Hester Collyer in (movie) The Deep Blue Sea and I got married - none of which I'd ever done before." British actress Rachel Weisz admits 2011 was a good year for her after tying the knot with James Bond star Daniel Craig. Quote: "I don't talk about my work, and nor does he. It's very private. There is nothing worse than two actors getting together and talking about acting. It's like the end - it's the worst." Rachel Weisz insists she doesn't talk about her experiences on set when she returns home to her husband Daniel Craig. Quote: "I started out very avant-garde... It was more like performance art. It was me and another girl, and we were at university together. We had this stepladder, and we used to basically hurl each other off this ladder, and often we would bleed. We were 18 years old, and we just thought that was really cool and radical... I had a ladder tattooed on my hip to commemorate this theatre company." Actress Rachel Weisz explains her hip tattoo. Quote: "The only thing to ever get me in trouble would be someone looking at my girl the wrong way. That always got me going. I still get jealous... I was in a bar in France and this guy pinched my girl's a**, and I flew across the room, kind of lifted the guy up. These days I'm much more happy to have a quiet word with somebody." Actor Daniel Craig insists he's nothing like tough guy James Bond in real life - he'd only pick a fight if someone disrespected or flirted with his wife, Rachel Weisz. Quote: "He is really into science and batteries and magnets and how things work. He is just finding his own way, but he has so many people around him in the arts that he will probably rebel and become a banker. I don't push him towards anything. I just let him be." Actress Rachel Weisz reveals her son Henry, with ex-partner Darren Aronofsky, is more interested in science than drama. Quote: "It's a major, major problem. I don't know if it's an old boys' club but it's frustrating." Actress Rachel Weisz wants to see more female moviemakers. Quote: "The test, I thought it was challenging... I had to study pretty hard actually, it was multiple choice and then about 10 verbal questions." British actress Rachel Weisz struggled with the tough naturalisation test to become a U.S. citizen last year (11). Quote: "I used to collect Pierrots and harlequin clown dolls... I really liked their little diamond outfits." Actress Rachel Weisz on her childhood collection. Quote: "There's nothing like a blue-eyed boy in a stripy blue shirt!" Rachel Weisz on falling for new husband Daniel Craig on the set of their new film Dream House. Quote: "I wouldn't make one (a baby) just for the sake of giving my son a sibling, but... you never know." 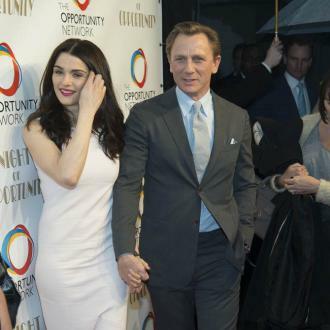 Rachel Weisz on adding to her family after marrying fellow Brit Daniel Craig in June (11). Fact: Newlyweds Daniel Craig and Rachel Weisz have been spotted together for the first time since they married in secret last month (Jun11). The two Brits were snapped holding hands at a New York airport on Friday (08Jul11). Fact: British actress Rachel Weisz showed off her wedding ring in New York on Tuesday (05Jul11), following her secret marriage to James Bond star Daniel Craig last month (22Jun11). Weisz was spotted sporting the band as she boarded a flight out of the city. Quote: "I'm incredibly messy which drives Darren mad. There's always stuff lying around my room everywhere. I don't have a good homemaking instinct. I'm working hard on it - especially now I'm a mum. It's getting a little better - but it's just not me to be honest." The Mummy star Rachel Weisz infuriates her partner Darren Aronofsky with her messy habits. Quote: "It was sad, but these things happen and we all parted on good terms." Rachel Weisz on Ryan Gosling's departure from THE LOVELY BONES. The actor was replaced by Mark Wahlberg in the movie. Quote: "Funnily enough, just recently I suddenly felt like I really would like to (get married). It’s just a feeling - I know it’s a funny thing.” British actress Rachel Weisz is beginning to make wedding plans with fiance Darren Aronofsky. Quote: "I don’t like travelling. Which is ridiculous. And it’s not because I’m afraid of dying on the plane or anything. I just like to stay at home. It’s a pretty hilarious problem to have." British actress Rachel Weisz is a real homebody. Quote: "I was going to lie to you about that. But then I thought, 'No, best to be honest.' I may (have been) the only person on the planet that hadn't read the book." British actress Rachel Weisz didn't read best-selling book THE LOVELY BONES before she was offered a part in the movie adaptation. Quote: "I loved that experience. It confirmed for me that acting was what I wanted to do. I think three people saw it, but it was wonderful for me." British actress Rachel Weisz on her role in flop 1998 movie I WANT YOU. Quote: "If I didn’t act, I’d be a nutcase. Some people have to do it. They have a lot of emotion they have to get out." Rachel Weisz was born to act. Quote: "I haven't done it very much, but I'm for hire in that zone if anyone wants me." The Mummy star Rachel Weisz is eager to star in a movie featuring romantic bedroom scenes. Quote: "Botox should be banned for actors, as steroids are for sportsmen. Acting is all about expression. Why would you want to iron out a frown?" Rachel Weisz refuses to follow the Botox trend. Quote: "I had a two-week rehearsal period where I had to learn to simulate to be able to play piano, banjo, guitar, juggle, unicycling and skateboard. I'd never been on a skateboard in my life." New mum Rachel Weisz on the demands of her new film BROTHERS BLOOM. Fact: The clothes actress Rachel Weisz wears in new movie BROTHERS BLOOM were almost all old outfits from her own wardrobe she had forgotten about. Quote: "I could never fill her shoes, she was so brilliant and beautiful, and an ingenue in those films." The Mummy: Tomb of the Dragon Emperor star Maria Bello praises Rachel Weisz's performances in the first two films in the franchise. Bello stepped in to play Weisz's character Evelyn O'Connell in the new movie after she chose not to reprise the role for the second sequel. Quote: "I like firemen. Irish firemen. What girl doesn't?" Rachel Weisz reveals her very specific male fantasy figure. Fact: Hollywood actress Rachel Weisz has proved she is the fairest of them all by dressing up as Disney character Snow White for a photoshoot with celebrated photographer ANNIE LEIBOVITZ. Fact: Actor Ryan Gosling has signed up to join Rachel Weisz and director Peter Jackson on the big screen adaptation of Alice Sebold's 2002 book The Lovely Bones. Fact: Oscar winners Rachel Weisz, Hilary Swank and Mira Sorvino all auditioned for the part of ALICIA NASH in A Beautiful Mind, but the part eventually went to Jennifer Connelly, who won an Academy Award for her performance. Quote: "And then I hear Darren: 'Take off his pants! Take off his pants!" Hugh Jackman on shooting love scenes with Rachel Weisz in THE FOUNTAIN - directed by Weisz' fiance DARREN ARONOFSKY. Quote: "They end up looking like something out of Planet Of The Apes if I don't pluck them regularly." Oscar-winning actress Rachel Weisz rues her bushy eyebrows. Quote: "We both have the same bushy eyebrows." Oscar winner Rachel Weisz on being mistaken for actress Brooke Shields. Quote: "There are a few names. Oscar isn't one." Rachel Weisz has no plans to name her unborn baby after her Academy Award win last night.